The Vietnamese Centipede is a large, aggressive species with a nasty attitude and a serious bite! The Vietnamese Centipede Scolopendra subspinipes is deceptively intriguing, because it is a beautiful arthropod. They can be quite variable in color. Most are a brown to reddish brown with yellow to yellow-orange legs, but they come in many other colors and color patterns too. These centipedes are also quite large, growing from about 4" to 8" (10 - 20 cm) in length. Some individuals will even reach a giant size of up to 10" or more. Besides being attractive, Vietnamese centipedes are hardy and easy to keep. They make a very nice addition to the collection of an experienced keeper, but they are not recommended for a beginner. Despite their good looks and impressive size, the Vietnamese Giant Centipedes are nervous, aggressive, and fast. These are some of the least expensive centipedes available as pets, but they are dangerous with a very painful bite. Their venom is of medical concern as just one centipede bite can cause pain and serious swelling in humans, and even worse for some individuals. Death from a centipede bite from this species is almost unheard of, but it has reportedly happened on one occasion to a child in the Philippines. You want to exercise care with this centipede. We do not recommend handling any centipedes. Scolopendra subspinipes currently contains eight described subspecies. These centipedes are not restricted to the country of Vietnam, as its name in the hobby suggests. The Vietnamese Centipede is found throughout the world's tropical and subtropical areas, especially in Southeast Asia. 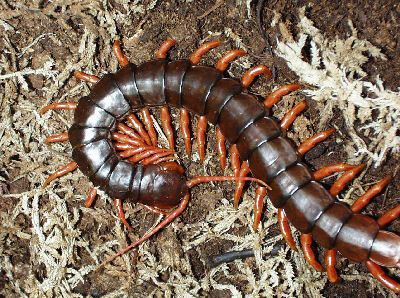 Habitat: Distribution/BackgroundThe Vietnamese Centipede Scolopendra subspinipes was first described by Leach in 1815. These centipedes are found from all over the world. Many originate from a wide range across southeast Asia, but they are also found in Japan, Australia, West Africa, South America in Brazil, and are also found in Hawaii. Other common names this centipede is known by are Orange-legged Jungle Centipede and Asian Forest Centipede. These are terrestrial invertebrates, mostly from subtropics and tropical zones. They live under stones and wood, in crevices, and in litter and soil. They will burrow some, staying underground on warm days and emerging in cloudy weather. They are carnivorous and feed on insects, lizards, frogs, and rodents in the wild.. There are eight described subspecies, but besides the nominate species Scolopendra s. subspinipes, only a few are seen in the pet trade and referred to with common names. These include the nominate Orange-legged Jungle Centipede or Asian Forest Centipede Scolopendra s. subspinipes, Chinese Red Head Centipede Scolopendra s. mutilans, Japanese Centipede Scolopendra s. japonica, and Malaysian Cherry Red Centipede Scolopendra s. de haani. Status The Scolopendra subspinipes is not on the IUCN Red List for Endangered Species. Description The Vietnamese Giant Centipedes grow up to about 8" (20 cm). As adults, all the subspecies of S. subspinipes range in size from 4" (10 Cm), like Scolopendra s. japonica, and on up to 8" (20 cm) like Scolopendra s. subspinipes. All subspecies of S. subspinipes have 18 to 19 segments on their antennae with the first six smooth. There are three spines located on the prefemur of the terminal legs. They are quite variable in color, but most specimens are brown to reddish brown with yellow to yellow-orange legs. This is the nominate species, it is brown to reddish-brown with an orange head and legs. Widespread throughout the tropics and is found in Africa, Asia, and even Hawaii. This centipede is primarily a reddish brown with a red head and red legs. It is found in Southeast Asia and are commonly available. The Chinese Red-headed Centipede has a black body, red first segment, and yellow legs. It is found in China and Japan. This species, though somewhat uncommon in the trade, that has been farmed in a communal setting for many years in Asian countries. This species is brown with blue and white banded legs. It is the rarest subspecies in captive collections and in nature is found only in Japan. Food and FeedingSmall juveniles will eat pinhead crickets or other small insects. As adults they will feed on prey that is not larger than themselves, including large crickets, cockroaches, and even pinky or fuzzy mice. It is generally suggested however, that you don't feed prey that is more than half the length of the centipede. Feed crickets and roaches once a week. Once a month feed a small pink mouse. Keep in mind that overfed invertebrates, and especially overfed centipedes, seem to die much sooner than those that are kept "lean and mean". HousingA large enclosure that offers plenty of floor space and a deep (4"+) substrate of damp sand and peat moss is ideal. This species will spend most of its time buried in the substrate with only the tips of the back legs or its antennae above ground. Also offer a few well-placed pieces of cork bark, bark, or a sturdy slate shelter to keep specimens settled. Cage CareA good habit to get into is cleaning up any uneaten prey items the day after feeding your centipede as decaying organic matter commonly attracts mites, fungus, mold and other potentially harmful organisms into the enclosure. If your pet has recently molted, remove uneaten prey items immediately. Newly molted centipedes are vulnerable until their exoskeletons hardens. BehaviorWhen first introduce to its new enclosure, the centipede will often explore the entire area. Once settled in, it will be very active, and will eat allot just before molting. The enclosure can be fitted with a red or blue bulb to be turned on at night to watch the centipede foraging for prey and exploring its surrounding. Yet even during the day they tend to stay on the surface rather than burrowing, and they don't spend much time hiding. When disturbed they will often attack and bite at anything, or move very quickly trying to escape. Handling We do not recommend handling any centipedes. The Vietnamese Centipedes are nervous and aggressive. When disturbed they will often attack and bite at anything, or move very quickly trying to escape. Despite photos of "daredevils" handling large specimens, all Scolopendra are capable of delivering a very painful venomous "pinch". Large specimens should be considered medically serious and some people with reactions to insect venom and those with small children should be very cautious when keeping large Scolopendra species. Reproduction There is no copulation for centipedes to reproduce. Rahter centipede males deposit a spermatophore for the female to find and take up, which then fertilizes the eggs. For species In temperate areas eggs are laid in the spring and summer, but in subtropical and tropical areas they seem to be laid most anytime of year. Diseases: Ailments/TreatmentsVietnamese Centipedes have relatively few common health issues as long as they are fed properly, housed in an escape proof enclosure with proper humidity levels, and the cage is kept free of decaying organic matter. Centipedes will feed on a variety of prey including grasshoppers, moths, worms, and even small vertebrate prey, but be cautious of any prey that is captured in nature as they may be carriers of internal parasites. Keep in mind that overfed invertebrates, and especially overfed centipedes, seem to die much sooner than those that are kept "lean and mean". Newly molted centipedes are vulnerable until its exoskeleton hardens, so should have uneaten prey removed immediately. Availability Vietnamese Scorpions are commonly available from invertebrate and reptile dealers on-line. They are imported in large numbers from Southeast Asia. C. Sandefer, The Giant Centipedes of the Genus Scolopendra, Privately published. Oklahoma City, OK. In '68 outside Kontum, Vietnam we set up a camp on a nearby hill. We found numerous 4-5 inch centipedes. The Montagnards explained they were nasty. On inspection I found out why. Holding one with some bamboo tongs I held it near a flame. It sprayed st the flame. Turned out that each segment had 2 glands that defensively sprayed an acid. So, besides being bitten, you did NOT want to roll on one in you sleep. I would not recommend this type as a pet. When I was in Vietnam, we were setting up for the night by carving out a drainage ditch around our sleeping position. This was a hill area. As we were scratching the surface the bayonet poked through to a tunnel. The smell that came out was very acidic. As we watched a centipede emerged pissed as all get out... followed by another... these suckers had to be a minimum of 3 feet in length... have never found reference to any centipede larger then 18 inches. Bob, I would like to know where you found a reference to 18 in. centipedes? When I was in the central highlands of Vietnam We ran into 12 to 18 in. centipedes but the reference on this web site says the biggest Vietnamese centipedes are 8 in. The ones I seen would of had babies bigger than 8 ins. Hope you can help me out. "kevin"
Up at Pleiku, VN I was working in grass underneath my helicopter when I felt a pinch then stinging pain on my lower back. I quickly crawled out from underneath the Huey and grasped at my back pulling off a foot long ugly red-brown centipede. It wrapped itself around my wrist but I managed to get it on the ground and stomped on it finally killing it. My lower back burned and within 15 minutes I was doubled over with stomach cramps and dizziness and hyper breathing. My crew grabbed me and got me first to a medic who shot me with atropine and then about a half hour later a doctor managed to get some antinerve agent (?) from air base clinic about an hour later. During that time I was still hyperventilating; waves of stomach cramps and dry nausea. After the antinerve agent I started to recover almost immediately. Within an hour I felt pretty much back to normal and was able to fly later that night with no ill effects. 40 years later I will always remember the pain and disorientation from that centipedes bite. I want to buy a 12''centipede or bigger in a glass case for my trophy room, IF anyone knows where I can get one please let me know! I was bitten by one of these. Came close to ending my career and my life. Ugly bastards. I live in Cambodia in a village near Phnom Penh. We get centipedes here all the time especially when the wet season begins. A couple of years back we had a big one definitely over a foot long, I'd say close to 50 cms from memory. We had a lot of kids around and it was in our school so one of the guys killed it but only after chopping it with a spade several times. I'm also trying to find what type of centipede it is that we get here. They are definitely painful if bitten - the locals are very wary of them. Do you know what they are? When I was in Nam one night I was sleeping on the back deck of our tank in the jungle and woke up with a 6' centipede sucking or whatever on my arm...don't remember pain but my arm had a 6' swelling and it left a scar-type mark for about a year...took normal jungle rot marks years to go away. I want to buy a 12''centipede or bigger in a glass case for my trophy room. If anyone knows where I can get one please let me know! vietnamese centipede about 12 inches long you can contact me at juanignacio1505@yahoo.com they can even special order them for you i have all details and phone numbers for you ! I'm interested in getting one as well. I have been reading the care for them, all kinds. I like planted vivariums, I've owned scorpions, spiders, tarantulas, but never a centipede they are so cool looking. I'd want to do a large heavily planted vivarium like 75 to 125 gallon if not bigger. Yes it's alright if it gets lost in there that's what it's supposed to do. But feel free to reply with opinions (no bug haters please) and/or helpful info. Why do you want to buy a 12' centipede for your trophy room? Just right now(29/04/2015; 12:42PM) orange legged centipede walked/moved on my leg.. but that was a slow moving one centipede..and at last i killed the centipede in my home..